This encyclopedic early history of Walla Walla, Whitman, Columbia and Garfield Counties in Washington Territory and Umatilla County was published in 1882. Supplina Hamilton was living near Waitsburg, WT with his family in the 1880 Census. This roughly contemporary account mentions Supplina 'Elder Hamilton' and his role in the Christian Church at Waitsburg. S. Hamilton (thought to be Supplina) is also referenced as one of the first (first one two appointed) county commissioners of Umatilla County, Oregon. This document just has a few selected pages relating to Waitsburg, Supplina and the founding of Umatilla, County. Supplina Judd, age 77, is listed in the 1877 Washington Territorial Census. His name was misspelled (which was not unusual) and he was listed as 'Saplina Judd.' Supplina was the brother of Altha Judd, the wife of John Hamilton the patriarch of our Hamilton family line. This census provides proof that Supplina lived in Washington State. Supplina must have died shortly thereafter as his heirs were sued in 1879 for foreclosure on property he had purchased in Lewis County. Two of his grandchildren, Willie and Johnnie Proaps are buried in the Grand Mound cemetery near Rochester, WA. Both of these children died on August 4, 1877. The location of Supplina's grave is unknown. Supplina was known to travel back and forth from this home in Palmer, Christian County, Illinois. It is unclear where he died. Supplina was also known as 'Squire Judd' and was a country lawyer in Illinois. From Supplina Judd's letter to Supplina Hamilton in 1874 we learned that Supplina Judd had owned land near the 'Puget Sound' that he had bought from a neighbor in Illinois and was unsuccessfully trying to sell. We don't know if this foreclosure suit in Thurston County, WA in 1879 is regarding that piece of property or of this is another land investment. Anyway, Supplina is listed as a defendant along with his son, Charles and two other couples, the Eastman's and the Proaps. An interesting comment on the suit is this: "Mary and Sheppard Proaps are heirs-in-law of Supplina Judd." This PDF file contains copies of the actual case file documents archived by the WA Secretary of State concerning the foreclosure on property owned in Lewis County, WA by Supplina Judd. Along with filing and court docs there is a copy of the original mortgage document. There are the summons documents sent to the plaintiffs. There is the Order of Sale document. There is an affidavit from the sheriff of Lewis County testifying to the delivery of the Order of Sale to the abandoned premises. There is a document from the local paper of record with a clipping testifying that the summons were published. These documents imply that there is perhaps a probate document for Supplina Judd somewhere in the WA State Archives yet to be discovered. If Supplina Judd died in Washington, it would be great to discover where he is buried. His Judd family descendants have lost the memory of the place of his death and burial. 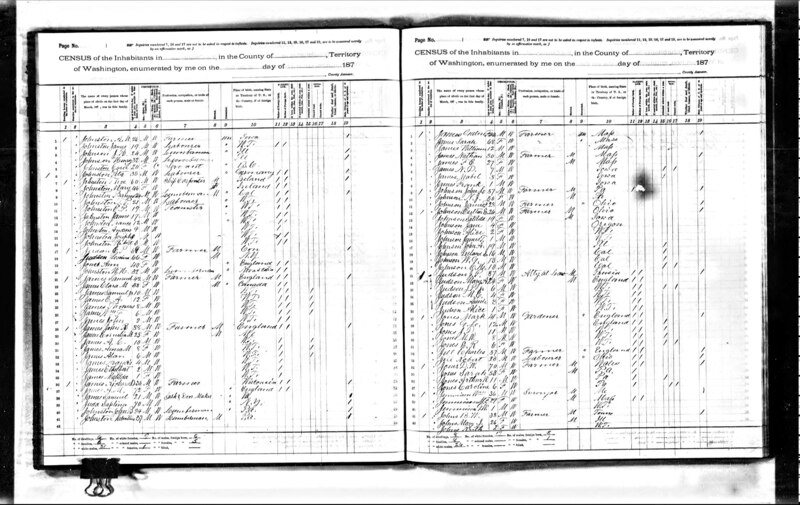 Supplina Judd - Event: Lived, Year: 1800, Place: Walton, County: Delaware, Province: New York, Source: Reel 22, 1800 Federal Census of New York, Microfilm Series M32, Publisher: National Archives, Washington, DC. Supplina Judd was the brother of Altha (Judd) Hamilton, the son of Supplina Judd, Sr. and the uncle of Supplina Hamilton. It's possible (though just conjecture) that Supplina Hamilton was in this household in 1840. Supplina Hamilton was Supplina Judd's orphan nephew. Supplina Judd was married to Susan Jane Pratt on October 26, 1837 in Morgan County, Illinois, so the older children in the household in 1840 would not have been his own. Note that a neighbor was one of the Powell family, Jackson. Supplina Judd (Jr.) was the brother of Altha (Judd) Hamilton. His wife was Susan Jane ("Jane") Pratt. Supplina Judd was born November 4, 1774 in Hadley, Hampshire, Massachusetts. He married Jemina Pooler on January 26, 1797 in South Hadley, Hampshire, Massachusetts. In 1800 he was living with his household in Deleware County, New York near his in-laws the Poolers. Supplina Judd and Susan Jane Pratt Marriage Docs, Morgan County, Illinois - 1837. Supplina Judd was the brother of Altha Judd the mother of Supplina Hamilton. This is an image of the page from the 1810 US Census book showing Supplina and Jemina (Pooler) Judd's household. Supplina's family was living in the town of Sidney in Delaware, County, New York. Supplina's household is the ninth entry from the top of the page. Note: There were four Pooler families living in this small community in 1810. It's very likely that at least some of them were related to Jemina. 12) Supplina Judd purchased land in 1835. This is an 1862 Illinois Survey Map that includes the acreage. Supplina Judd was the brother of Altha (Judd) Hamilton. Altha was the wife of Supplina Hamilton. 16 year old Mary Judd is in this census record is Supplina's daughter. She would married a man named Shepard Proasp and finish her days in Colorado. This PDF document contains selected pages from a very interesting work. It's the Centennial History of Mason County Illinois published on the U.S. Centennial in 1876. It speaks of the founding and early days in Mason County, IL. John and Altha Hamilton along with Suplina Judd (Altha's brother) and perhaps other extended family are believed to have emigrated from New York to Mason County in about 1831. They were all living near each other in the 1830 Census in Amity, Allegheny County, NY. Supplina Hamilton (named for his Judd Grandfather and Uncle) was born in Illinois in 1832. It is believed that John and Altha were both dead by around 1839 leaving the children of John and Altha as orphans. In the 1840 Census there are extra older children in the Suplina Judd household in Mason County. Children that are too old to be his kids. It may be that 8 year old Supplina Hamilton may have been living with his uncle Suplina Judd in Mason County at this time. These pages tell us of the early day life in Salt Creek Township and in near by Havana, Illinois. They even speak of Suplina Judd who was known as 'Squire' Judd (squire is short for esquire... often used to refer to a lawyer). This would have been Supplina Hamilton's uncle. It sounds like 'Squire' Judd was a character and remembered in the community. S. Judd is also mentioned as being on the voting rolls in 1848. Other neighbors mentioned are John McCarty (Jane McCarty married Greenberry Templeton and was the mother of Supplina Hamilton's daugher-in-law's Laura Annettie and Julia Aletha Templeton) and N. Powel. Supplina Hamilton came west across the Oregon Trail in 1951 with the Powel train. In Supplina's letter to J.M. Powel in 1899 remembering the journey, Supplina said that he came with 'Uncle Noah' Powel. Supplina and the younger men were the teamsters. 15) Supplina Ward Hamilton - Birth Return - A girl? This link is to a Washington State Brith Return (record) recorded by Dr. G. W. Farmer of Whitman County, WA. 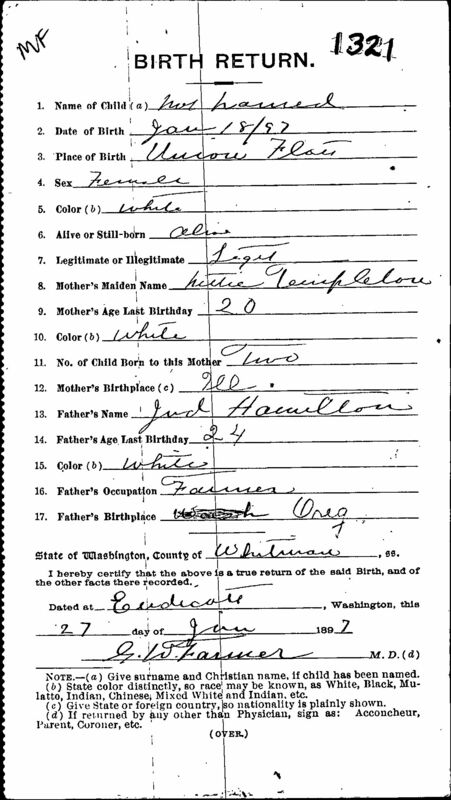 Dr. Farmer recorded the birth of a "not yet named" female born to Judd & Annetta "Nettie" Hamilton in Union Flat (Creek) south of Endicott, WA. The date of the child's birth is 1/18/1897. Dr. Farmer signed the Birth Return on 1/27/1897. Unless Dr. Farmer was overworked and mistaken... the only birth to Judd and Annettie that we know at that time was Supplina Ward Hamiilton (male) born on 1/19/1897. Did Ward have a twin sister that was born live but did not survive or was Dr. Farmer needing a rest?? More research may tell us. Dr. Farmer delivered virtually all the Hamilton children and relatives in this era and ranged at least from Union Flat Creek to St. John to Steptoe. He must have been a pretty amazing country Doc. Dr. George W. Farmer was born in Canada and came to the US in 1881. Later he is found in census records in Spokane, Espanola and Benton County. This scanned image from the Washington State Digital Archives is Supplina Ward "Ward" Hamilton's WWI Mililtary record on file with the State of Washington. Army Serial Number: 4.711,945. Inducted 9/15/1918 at Okanogan, Washinton (residence, Nespelem, WA). Served in 15th Company CAC "Coast Artillery Corps" (based out of Ft. Stevens, Oregon) until 11/17/1918 and then attached to the 104th Artillery Battery (& infantry) until discharged on 3/28/1919. Rank: Private. Served overseas from: 10/28/1918 to 3/7/1919. Honorable Discharge. Supplina Ward "Ward" Hamilton (son of Judd Hamilton and Laura Annettie Templeton) was awarded a patent on a 160 acre homestead in Okanogan County, WA, West of Nespelem, WA in 1929. 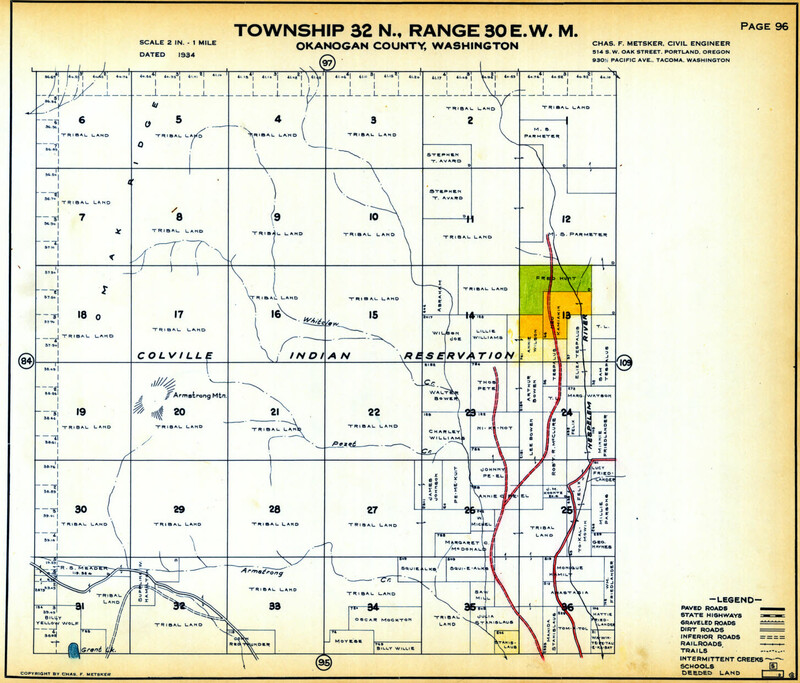 Great Uncle Ward's homestead parcels are marked in the lower left of this township map (Township 32 North Range 32 East Willamette Meridian). Supplina Ward "Ward" Hamilton was the son of Judd and (Laura) Annettie (Templeton) Hamilton. This is the homestead grant document to Ward Hamilton dated May 1929. The exact location of the homestead is on the document. I believe it was near Nespelem, Washington or up the San Poil River. Ward was a son of Judd Hamilton who was the son of Supplina Hamilton and Sarah Jane "Jane" (Sumpter) Hamilton. Land patents document the transfer of land ownership from the federal government to individuals. S. Ward Hamilton was a son of Judd and Annettie Hamilton. Judd was a son of Supplina and Sarah Jane 'Jane' Hamilton. Ward lists his date of birth as Jan. 19, 1897. Age 21 and living in Nespelem, WA. He lists his nearest relative as his father, Judd Hamilton in Nespelem. His employer as Pete Jonason in Almira, WA. (Note: Almira was the nearest rail head for Nespelem. It was 35 miles away but it had stage and freight links with Nespelem.) The Hamilton's store in Nespelem, The Blue Goose, was a stage coach stop. Farmers took their crops and cattle to Almira to ship out to market. The trip to Almira required a decent of over 900 feet to the Columbia River, a ferry crossing, and then a long climb up out of the coulees gaining over 1000 feet in elevation before reaching Almira along the Old Coulee Road. Here's a link to a photo of the Almira rail head in 1920). Frank and Heman were son's of Supplina. The households are adjacent and at the bottom of the page 1 and top of page 2. Supplina's name (again misspelled) is partially obscured. This PDF file has the chapter from the book, 'The Early Indian Wars of Oregon' on the Yakima Indian War or 1855/56. This book was published in 1894. This large work was commissioned by the Oregon Legistature by House Concurrent Resolution Number 22 in 1891 to, "cause to be compiled, tabulated, and published, as far as is possible from the material in his possession, a complete record of the early Indian wars of Oregon, including the wars of 1855 and 1856..." Included in the back are the muster rolls of Company D of the 1st Regiment of the Oregon Mounted Volunteers. It was this Company that Supplina Hamilton volunteered into from Linn County, Oregon in October of 1855. His is listed in the muster rolls with his name misspelled (as was so very typical in documents) as Sapplina Hamilton. 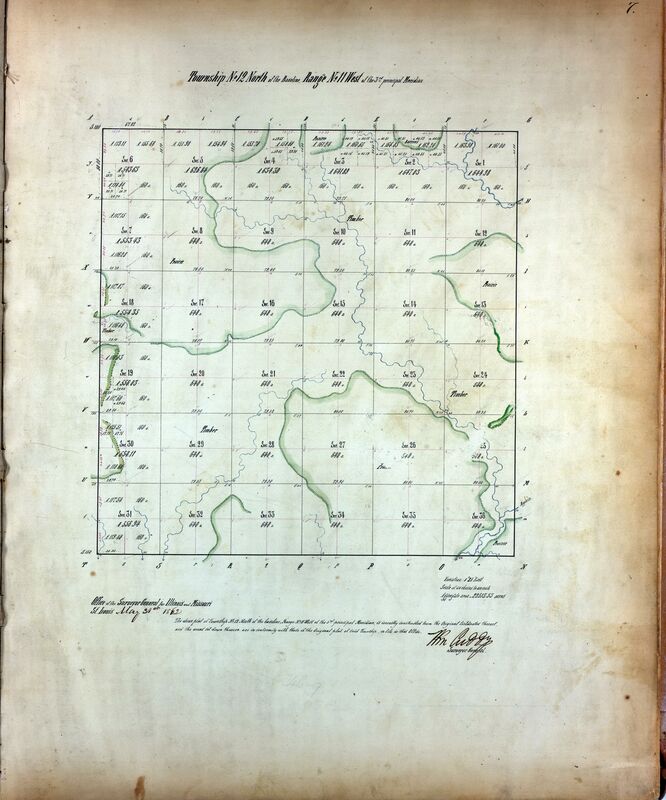 This page scan is from Plummer's Complete Atlas of the County of Pierce, Wash., Township 20 North Range 6 East. (1889). 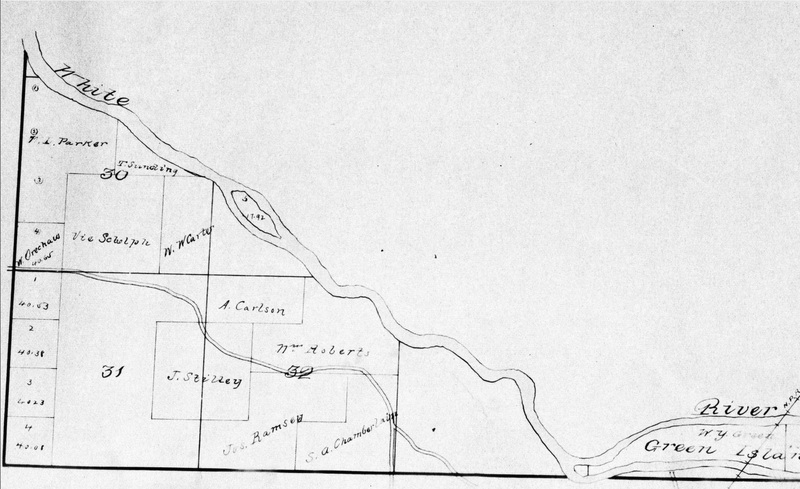 Living next to their friends the Stilley family, this map shows the James and Mary Ramsay property in just northwest of Buckley, WA in 1889. The Ramsay's youngest daughter, Lillian or Lillie was the mother of Elsie Luetta (Galloway) Hamilton. Lillie was born on this homestead in 1887. One of the more amazing finds related to our family history contained in the Seattle Central Library is the book: "Trails and Tales of The Early-Day Settlers Of North-Eastern Okanagon County Washington." This book faithfully records the history of the families who pioneered Okanogan County including those in Wauconda and up Toroda Creek. This PDF document contains selected pages of that large work. I've highlighted interesting passages in yellow. There is an incredible hand drawn map from 1901 that shows where the Galloway homestead was located just south of 'old' Toroda. There is a remembrance of the Toroda school house which was initially a log cabin and then the first frame house version was built on the Bill Galloway place. William "Bill" Galloway was a son of Amasa and Elizabeth Galloway and a brother of Charles Galloway the father of Elsie (Galloway) Hamilton. There is also a section remembering Amasa Galloway ('A. Galloway') and his family including his granddaughter (my grandmother) Elsie. There is a mention of the Stilley family, specifically Jim Stilley. Jim was the oldest son of Jeremiah and Mariah Stilley who were very close friends of James and Mary A (Spaulding) Ramsay and who lived next to the Ramsay's in Pierce County near Puyallap, WA and who emigrated with them by wagon to homestead near Wauconda. Also mentioned on the early road cutting crews were George and John Ramsay. George and John were brothers and sons of James and Mary Ramsay. Mentioned as a worker and patron of the road building effort was Arthur Lund of Tonasket. Arthur Lund was a friend of the Ramsays. James and Mary were (according to their granddaughter, Elsie) large depositors in Arthur Lunds' bank in Tonasket (in later years) and Mr. Lund took a great interest in their great-grand child Darrel Hamilton in assisting with his medical care and became a patron of the Maurice and Elsie (Galloway) Hamilton family when they lived in Tonasket in later years. There is also a discussion of the formation of Wauconda Cemetary. Relatives buried in the cemetary include James Ramsay, Effie Galloway (baby sister of Elsie Hamilton and daughter of Lilly Ramsay) and Charles Spaulding. Charles Spaulding is thought have been a brother or nephew of Mary (Spaulding) Ramsay. I also included the section on the Wills family. The Wills family bought the Bill Galloway place and the kids remember their growing up years on the 'Galloway place.' I love their comment: "Wayne and I spent many hours trying to solve the story behind the shotgun holes in the front door, floor and ceiling of the Galloway house." The PDF document is 11.5 mb in size. This is a transcription of the affidavit provided by Supplina Judd vouching for the citizenship of his nephew, John P. Hamilton. Actually now that I read it closely... it appears to be an example affidavit provided by John and enclosed in the envelope with the other pages. It's not likely that the affidavit was returned as we believe Supplina Judd was dead by this time. We believe that the letter and sample affidavit wound up in the possession of Duron Hamilton, John P. Hamilton's nephew who was living near Waitsburg, Wa. Since Duron was receiving letters from John in the same period, the small town postman may have helped to make the connection between the two families. It's interesting that John notes his birth date and place and his mother's name, Althah Judd Hamilton, and Supplina Judd's relation to Altha(h) as her brother. This transcription was likely done by the late, Joyce (Stover) Hamilton. In making photo copies of these documents Joyce included the envelope it came in along with a letter from John P. Hamilton to Duron Hamilton in Waitsburg in January of 1894. Joyce's husband, Gordon Hamilton, is a grandson of Duron Hamilton.